HUDSON, NC: The Southeast Super Truck Series Presented by City Chevrolet & Textron Off-Road has had a very succesful start to the 2018 season. Five races down and three winners, only two drivers have won twice so far this year. Those two are former past champion Kenneth Headen & Rookie sensation Ashton Higgins. 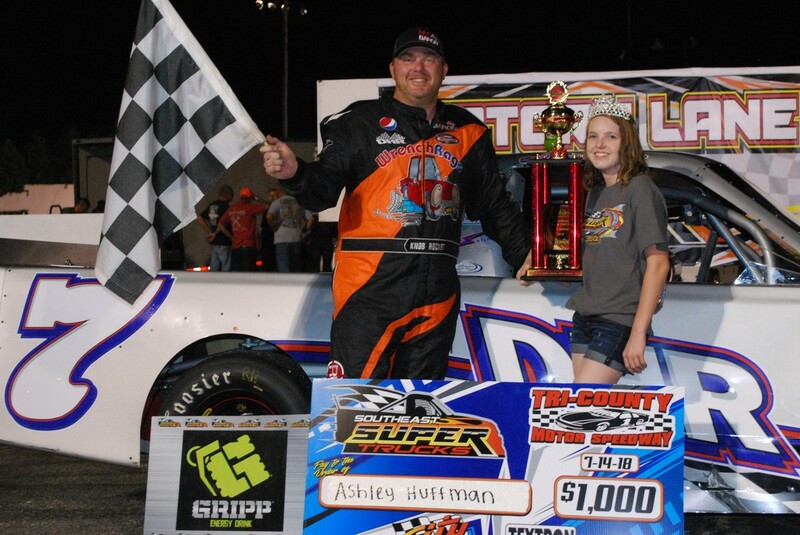 The series entered its sixth race of the year on July 14, at Tri-County Motor Speedway in Hudson, NC. The drivers and teams filled into the 4/10th's mile facility and prepared for the Safety Inspection before hitting the track. It was no suprise that the young super star Higgins set the fastest time in the first round of practice followed by Tyler Worley, Kenneth Headen, Greg Nix, and Ralph Carnes (who is pulling double duty, racing in both Super Trucks & Limiteds). The teams had one more shot to dial in their race machines and send their drivers back out for the final round of practice. Headen found himself on top of the speed charts in the Final Practice round, with Higgins in second, Clint King (who is making his return to the series this year) in third, Nix in fourth and rounding out the top five was Carnes. Qualifying was up next for the teams, and all 11 drivers made a stab at it. However it was the hometown celebrity, Ashley Huffman who claimed the Renegade Race Fuels Pole Award with a impressive lap time of 16.649 and also missed both practices earlier in the day. "We knew we wouldn't get any practice on Saturday, so we went on Friday and felt like we were pretty decent. Casper, my Crew Chief called me earlier this afternoon and told me made some adjustments for the changing track conditions from Friday and he hit the nail on the head" exclaimed Huffman. He was followed by Headen in second, Nix in third, Carnes in fourth and Jamie Barbrey in fifth. Higgins attempted to make his qualifying run however he suffered a broken rear end and was forced back to the garage area to assess the repairs. Huffman rolled a "4" on the invert dice which would now allow short track veteran Ralph Carnes to lead the field to the green flag. The drivers pulled their truck's onto the track to get lined up for their feature, Higgins who was unable to make the correct repairs to his truck, was going to start dead last in the #88 Jeff Caldwell prepared truck. Carnes followed the pace truck around the speedway. He quickly went to work and tried to pull away from the field. However Headen had other plans, Headen made a move on Carnes on lap five and was able to take over the top spot. The first caution flew on Lap 8 as Worley and Nix tangled on the track. Headen led the field back to the green flag with Carnes on his outside. Huffman began to turn on the heat and began working his way towards the front reeling down the leader. Hard charging Toby Hollifield had now worked his way inside the top five. Xfinity driver Clint King now began working his way through the field, he now found himself passing Hollifield bringing Higgins with him with just 25 laps in the books. Higgins began to set pressure to the back bumper of King. The pair raced side by side for several laps, however after a five lap exciting battle, the two got together resulting in King spinning in turn four. Headen once again paced the field back to the green, with Huffman on his outside. Huffman was able to out duel Headen and take over the top spot on the restart. "I gave the race away, while leading I got into the wall on the back stretch and knocked the right side body and exhaust loose. Mu team gave me a great truck and I screwed up in the drivers seat" stated Headen. Only until the third caution flew as #66 Bennie Davis spun coming out of turn four. This time it was Huffman who was in the captains seat on the restart. He had a perfect start and took off like a rocket, and began to pull away. On lap 39 the fourth caution flew as Hollifield found himself looping it around in turn four. The dreaded curfew was looming close as TCMS has a noise ordinance in place, so the Series Officials decided to cut the laps down a few in order to comply with the County. Huffman led the field once more to the green flag, this time he never looked back. He went on to capture his first win of the season at his home track and in front of his family and friends. He was followed by Headen in second, Carnes third, Higgins fourth, and Barbrey in fifth. Hosford who has been very good here the first two visits this season struggled all night with the handling of the truck and made several pit stops trying to correct it. Hollifield was able to rebound from a late race spin and finish sixth. "The win means a lot, Ive wanted to get to Victory Lane with the SEST Series for several years and have always came up a little short. This series has an unbelievable amount of talent and very fast trucks. And to be able to win one of the races, especially at Tri-County is very special. My driving career started there 20 years ago, and its always nice to come "home" and visit Victory Lane! I cant thank my entire Dwight Huffman Racing team enough for all their hard work, this win was all because of them, I was just the lucky one that got to sit in the seat!" stated Huffman in Victory Lane. Headen added a bigger cushion to his points lead with another top five finish. However Higgins is coming on strong. The Series will invade Caraway Speedway on July 28th for the first time ever. It will be very exciting to watch as none of the drivers will have a advantage on anyone. So make plans now to make your way to Sophia, NC to catch the "Most Awesome Show On Wheels".